My bedroom is quickly becoming overrun with children's books. 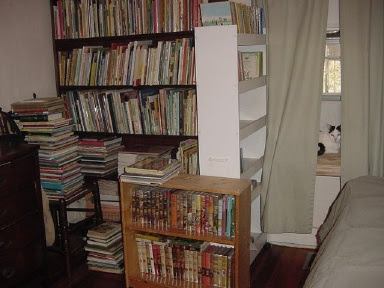 I now have five bookcases, all full, and three big stacks about knee high on the floor waiting for shelf space. This picture shows only half of the books. Not to mention the case in my office. And the 35 bookcases at the shop. I'm thinking one of my projects for my spring vacation will be to clean out the basement and put in three or four big cases. I bought a super-capacity dehumidifier to keep them from becoming musty. I'm just wondering if there's a good way to keep them safe from the cats. It's funny; when people ask me if I collect any types of books, I typically answer no. I have maybe two smallish cases of my favorites for keeping, and everything else is for sale. But it looks like collector or not, the result is the same. Like a collector, I spend most of my spare money on acquiring new books, and like a collector, my home is jam-packed with books.